"Respond" addresses the reaction to the grand jury's decision not to indict officer Daniel Pantaleo. DUMBO — A neighborhood studio is set to host an art show in response to the controversial grand jury decision not to indict officer Daniel Pantaleo in the death of Eric Garner, featuring hundreds of works from artists like Dread Scott. Smack Mellon received more than 600 submissions in less than two weeks for their upcoming show "Respond" — an exhibit of sculptures, photography, paintings, textiles, video and more that address some of the public sentiment about the decision. Garner died in Staten Island on July 17 after Pantaleo put him in a chokehold. On Dec. 3 a grand jury voted not to indict Pantaleo sparking protests all over New York City and beyond. The volume of the response surprised curators who received hundreds of submissions from all over the world during the holiday break. "Even though it was during a very busy time the response was overwhelming," director for Smack Mellon, Kathleen Gilrain, said. "We are excited to offer this big space to give people another way, along with protesting, to respond to the decision." Gallery staff postponed their scheduled shows in the wake of the decision to host "Respond." 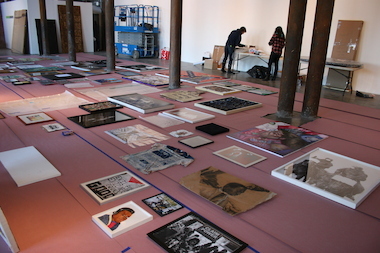 They chose 200 pieces to put on display in their 5,000-square-foot gallery space located on Plymouth Street in DUMBO. Artists in the show range from amateur to more well-known names like Dread Scott whose work has been exhibited at the Whitney Museum of American Art and the Brooklyn Academy of Music, Mel Chin who has shown at the Museum of Modern Art and Heather Hart who's work is currently on display at the Brooklyn Museum. Respond takes place from Jan. 17 to Feb. 22. The opening reception is scheduled for Jan. 17 from 5 to 8 p.m. at 92 Plymouth St.